Southern Queensland’s next eco-tourism attraction has taken root beside the burbling Gap Creek between Brisbane and Warwick. Three large labyrinths made from carefully selected local stones and native plants are under construction at Bestbrook Mountain Resort, 36 kilometres north-east of Warwick on the Cunningham Highway. When completed later this year, the labyrinth ‘park’ will cover over two hectares and feature more than 1500 plants. Condamine Alliance is leading the exciting project as part of its biodiversity program, Enrich, which aims to boost biodiversity and increase native vegetation that can be used for wildlife habitat. “It is satisfying to create something that will attract visitors and wildlife alike. It will be a unique addition to our region so in that respect we are breaking new ground,” said Alex Kennedy, Condamine Alliance Principal Project Officer. 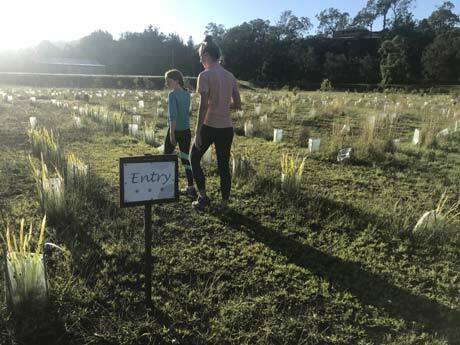 “It started out as a standard revegetation project but it has definitely grown into so much more thanks to the inspiration of our planting contractor and the enthusiasm of the landholders,” Ms. Kennedy said. “We are now looking at the region’s first trio of labyrinths constructed from local materials and plants to provide a place for learning and relaxation,” she said. Each labyrinth will vary in size, shape and the type of materials used. Many of the selected plants are bird attracting and known for their Indigenous use. The first and largest labyrinth will use native trees and shrubs while the second labyrinth will be planted with the perennial grass, lomandra. Its seeds were traditionally used by Aboriginal people for use in damper, and the long, flat, fibrous leaves were used for weaving. Large stones gathered from the property will form the third labyrinth. Plans are afoot to construct a special platform in the middle of the labyrinths so visitors can enjoy observing the bird life without disturbing them. Gum trees will be planted around the edge of the labyrinth park for the dual purpose of providing shade and wind protection for the labyrinths and food and habitat for the property’s resident koalas. The shape and layout of the labyrinths were carefully designed by Toowoomba horticulture teacher Peter Macqueen and the Enrich planting contractor Richard Thorpe. Mr. Macqueen has a long-standing interest in labyrinths and is the principal designer of the labyrinth at Toowoomba’s St Luke’s Cathedral. Labyrinths have been used for spiritual and meditative purposes for thousands of years. Unlike a maze, a labyrinth does not have dead ends that disorient you. Instead, there is a clear way in and out with the aim to enjoy a ‘walking meditation’. The project is a special initiative of the five-year Enrich program, which is supported through funding by the Australian government and is helping land managers to revegetate, manage weeds, control feral animals and plan for fire management. Stay tuned for updates on the labyrinth park’s progress in future.